Computer illustration creates new possibilities for artists. The Million Moth Vector Art project is based around an ideal graphic template for Geoffrey de Havilland’s famous ‘moth’ aircraft from the 1930’s. Several years were spent designing and refining the Tiger Moth template that is now generating new Tiger Moth liveries when desired. The model aircraft are available as downloadable files for printing on heavyweight paper, or in printed form. The designs are illustrated to achieve the most realistic appearance possible and include detail not achievable using paint. The de Havilland designs were assisted by the drawings prepared by the late Norman Eastaff, a de Havilland engineer and expert, via Janic Geelan of New Zealand. The intention of the project is to create a very large number of aircraft models to celebrate the internationalism of the civil aircraft and create an on-line art installation with some genuine archival properties. 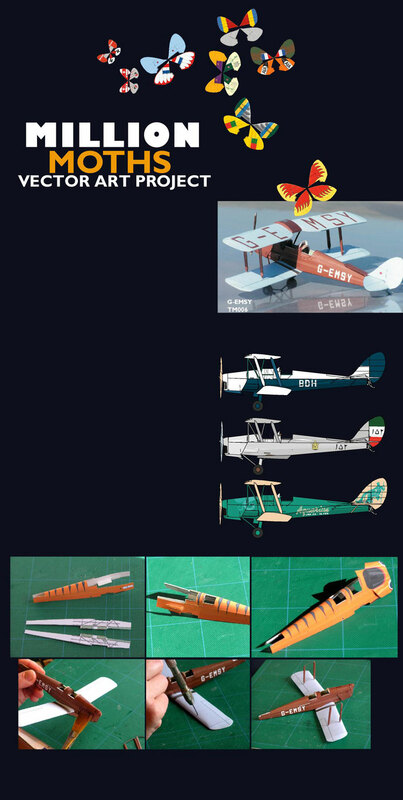 As well a goal is to foster greater interest in paper models as a activity and create a point system for rating the Tiger Moth model construction. The idea is to a establish a system to allow competitions and self-assessment more quantifiable than is generally the case.